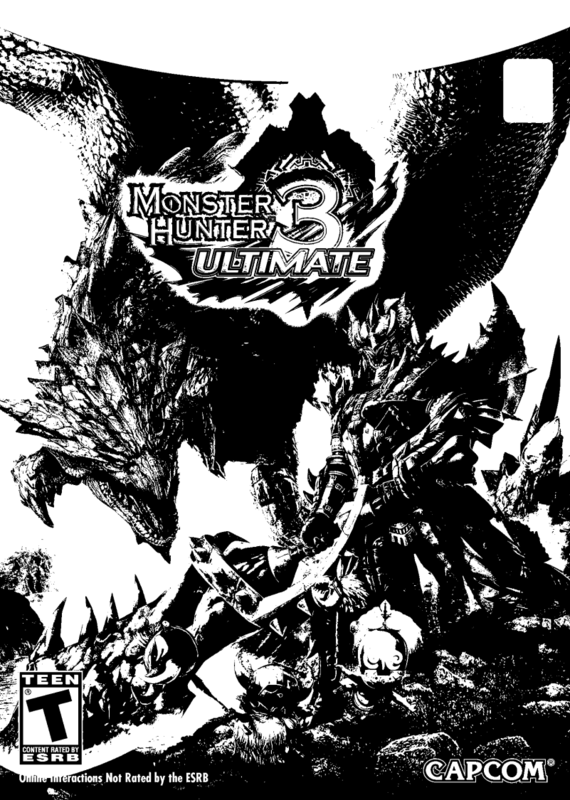 Let's consider Monster Hunter 4: Ultimate, the most recent Monster Hunter game before Generations. MH4U is a gigantic game full of stuff, or "content" in videogame industry parlance, sadly. Monster Hunter's soul, stomach, guts, and spine as a game is structured around lots of stuff and it wants people to give that stuff their full attention. Capcom took all the time to make it, and they want players of all demographics to feel invited into their many-layered world of stuff. So much stuff in Monster Hunter, man. Weapons, armor, worlds, monsters, just hanging out in this world and imagining how deep it goes is how it works its way into you. Now, on a Nintendo 3DS, there is minimal competition for that kind of game: the action-RPG stuff-haver. Yes, there are lots of RPGs on the 3DS, but not as many built around a persistent grind for stuff. We'll talk about that more in a moment. Furthermore, there are a lot of 3DS handhelds, globally, that means a lot of different types of people can be catered to with just one Monster Hunter game. It's great for easygoing RPG players. It's great for total obsessive-compulsive psychos. Capcom knows they can make the kind of game they want to make on 3DS. This is where we face our actual question: why can't they make Monster Hunter games on home consoles, too? If Capcom decides to consider making a stuff-filled Monster Hunter game for modern consoles, they have to figure out what it'd take to make it all to the specifications they kept up on 3DS. Remember, it's s a game about STUFF. All that stuff is textured to work on a 3DS at a 400x240 resolution, lower than low-end cellphones. Compare that to 1080p 60fps that most Capcom games run at on modern consoles. There has not really been a proper HD Monster Hunter game, excluding Monster Hunter 3 Ultimate on Wii U because that was a literally a port of the 3DS version. So why don't they put Monster Hunter 4 Ultimate on PlayStation Vita in the first place? Why make it for the 3DS when a superior system is available? Because a Vita is 960x544 resolution. They'd have to re-spec MH4U, for example, for over double the resolution. All the layers and layers of stuff would need to be upgraded. Ports aren't push-button, especially going from handheld to home console. Console / PC is tough enough, just take a look at the original Dark Souls PC release. Back on topic, how many Vitas exist? How many Vita owners would buy MH4U? How Vita owners many already own MH4U for 3DS? "Okay, make extra content to entice people," you think. That's extra dev time on top of the porting work. Add months onto the development cycle, time that could be spent on making Street Fighter V costumes to sell for $4 apiece, or something else predictable. Okay, why didn't they make MH4U for the Vita in the first place? The same reason why they didn't make Monster Hunter Freedom for the original Nintendo DS when they released that game for the original PSP: because they couldn't make the game they wanted to make for the DS. The PSP had the analog nub, and they needed that for their game. The same logic follows. Can the system accommodate the game they want to make and capture an audience's attention? They don't believe they can make a Monster Hunter game with all the stuff a MH game demands on an HD system, and still sell enough copies to stay out of the red. It isn't laziness or Nintendo paying them. Nintendo went out of their way to BUILD a New 3DS with a second analog nub to attract the game to their system. That was on Nintendo, and you're out of your darn mind if you think Capcom, a 3rd party company, chipped in to develop that hardware. Nintendo saw the MH + 3DS attach rate and knew having it on their system would shift hardware. Capcom saw the millions of 3DS systems in existence and thought about it for a microsecond. The final question for Capcom is: would they be able to sell 20,000 or 40,000 copies to recoup the cost of even porting MH4U to the Vita, the PS4, the Xbox One, the PC? Can you imagine 4 million people buying Monster Hunter on PS4 and Xbox One? Because that's what you need to sell for a hit on a console. There's an unpredictable market on home consoles for MH. HD games, even ports, cost years and dollars. Capcom, if nothing else, bets on their most reliable brands. Why isn't it on home consoles? Because home consoles are only a hit in the west, HD games cost time and money, and everybody playing high definition home console games in the west are already playing grind-heady games like Division and Destiny. They don't want weird, plodding Japanese 3rd person action. It's a matter of understanding their potential market. Capcom isn't pitching free books to invite users into their ecosystem, they're living the economics of running a game studio. Next up: Simple Answers no. 8: Why do people hate Pokemon Go?